There are three main aspects (or types) of “magick” or “ritual” that can be found within the Mardukite work. …is that work which will lead to self-honest knowledge and experience of the self and the Anunnaki. This is the true and faithful dedicated devotion that has been aforementioned as a prerequisite to this work in general. One could classify this first form of “magick” as “prayer,” since it is based on the ‘transmission’ of intention for the sole purpose of establishing the necessary relationship (and communication) with the ‘spiritual’ forces that one is becoming an “ambassador” or “priest” for in the material world. Systematic prayer-books (composed of clay tablets, of course) were also found in the private collections and even bed-chambers of the most successful priest-kings in Babylonian history. Although this part of the work is primarily “introspective” in nature and meant to prepare the individual, it can also be studied and developed in groups, orders and priesthoods (as it once was). …is the Anunnaki Star-Gate System. This form of practice is also “introspective” to the point that it composes “private” practices of the “priesthood” in their work with the Anunnaki, and not the ‘public’ and later and more recognizable ‘folk magick’ of the common people, which was usually more ‘superstitious’ in nature, often employing religious talismans and amulets. …is most closely identifiable with what anthropologists would observe as ‘cultural magick’ and it was the only aspect of the tradition that allowed for public observation and participation. Compared to the previously described “religious” and “celestial” forms, this practice is highly qualified to earn the title “low magick” in many respects. It reflects everything we have come to expect from the cultural archetype of Babylon – the rites of national spirituality that further strengthened the ‘system’ and the people’s belief in it via annual festivals; the ritual gestures and idol statue use among commoners to accomplish fertility and healing effects (often with the assistance of priests, but not necessarily so); even the ‘personification’ or demonization of perceived ‘negativity’, or even ‘pestilence’ and ‘infertility’ as a means of ritually destroying evil in the land with ‘suggestive symbolism’ that later became the basis for a morally-defined demonology (such as seen in the maqlu series of tablets). All of this resulted in a representation of the human relationship with the earth in ‘everyday life’ and ‘material existence’ on the planet within the systems of human civilization. In essence, just looking at these three aspects of the tradition described, one can even recognize the subsequent and cumulative fragmentation of the ‘systems’ as the relay of the energy evolved and developed outwardly among the human populations – and in essence, human consciousness. We begin with a self-honest life of unity with the ‘gods’ and a pious condition of ‘golden age’ living – ending with the use of waxen dolls to represent one’s enemy before a sacred fire and other forms of sympathetic magic used to affect worldly change at the most condensed end of the spectrum. 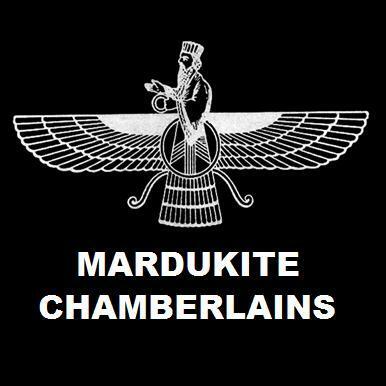 “Mardukite Magick: The Rites & Rituals of the Babylonian Anunnaki Tradition” edited by Joshua Free — is the economical black-and-white reissue of the complete original 2012 anthology Ceremonial Edition Trilogy including “The Book of Marduk“, “The Book of Zagmuk” and “The Book of Gates” from the Mardukite Research Organization. THE BOOK OF MARDUK (BY NABU) is a long-lost out-of-print ‘tablet collection’ that paved the way for intensive research and experimentation using Joshua Free’s ‘Necronomicon Anunnaki Bible’ and essentially comprises the internal methods of the ‘Order of Nabu’ to acquire communication and establish a relationship with ‘alien intelligences’ via a program of ancient-styled Babylonian-inspired (‘Mardukite’) initiation, dedication and devotion, reviving the same process used by ancient priests of the Sumerian Anunnaki in Mesopotamia. Original, never-before-seen ‘incantation-prayers’ appear in both English and Akkadian/Babylonian. The ‘Book of Marduk’ composes Liber-W and the Tablet-W series of the revised and expanded fifth edition of the ‘Necronomicon Anunnaki Bible’ edited by Joshua Free. THE BOOK OF ZAGMUK is the ‘official’ Mardukite-Anunnaki companion to the Babylonian New Year Festival, known as Akitu (Akiti) or Zagmuk, originally available exclusively to the modern revival organization known as the Mardukite Chamberlains. The Book of Zagmuk (by Nabu) is a specially prepared ceremonial text and selected ‘tablet collections’ that combine materials from the 2011 handbook “Mardukite Wizards of the Wastelands” in conjunction with critical excerpts from Joshua Free’s ‘Necronomicon Anunnaki Bible’ and essentially comprising the internal methods of the ‘Order of Nabu’ to establish Mardukite ‘religious’ continuity and Marduk’s royal legitimacy at the height of the Babylonian pantheon using the Babylonian New Year Festival, Akitu (Akiti) or Zagmuk, reviving the same process used by ancient priests of the Sumerian Anunnaki in Mesopotamia! The ‘Book of Zagmuk’ composes a new ‘Liber-Z’ extracting critical information from ‘Mardukite Wizards of the Wastelands’ in conjunction with the Enuma Elis and Descent tablets from the revised and expanded fifth edition of the ‘Necronomicon Anunnaki Bible’ edited by Joshua Free. THE BOOK OF GATES was first released as the third stand-alone title in the original 2009 Mardukite ‘Necronomicon’ cycle as “Necronomicon Gatekeepers Grimoire” (Liber-G) or in later editions as the “Anunnaki Gatekeeper’s Grimioire.” At the end of 2009, the complete series was compiled to formulate the most famous and widely distributed of our materials to the surface world, the Liber-N+L+G+9 anthology “Necronomicon Anunnaki Bible.” The “Book of Gates” (Liber-G) has always been used as a preliminary primer in practical ‘mysticism’ and ‘occult experimentation’ within the Mardukite-Babylonian Anunnaki paradigm and now, four years since its release from the underground, it remains uniquely popular! The ‘Book of Gates’ is a full color abridged ceremonial edition of materials published in 2009 as the ‘Necronomicon Gatekeepers Grimoire’ (Liber-G) also appearing in the 2012 nostalgia edition Liber-G and the complete Mardukite Year-1 anthology, ‘Necronomicon Anunnaki Bible’, now available in the 2012 revised and expanded 5th edition. Absolutely up my alley !